Minna from my short story Hooked On You returned in this full color aquarelle manga about how it is to stand up for your own moral choises when you are young. First time I got to make a manga all in color, and 75 pages to boot! 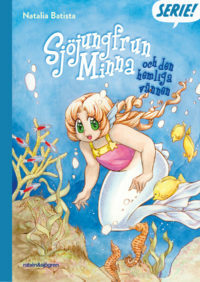 Published by Swedish childrens book publisher Rabén & Sjögren. After getting a deal with the Swedish publisher Kolik Förlag, publishing the series of three volumes in 2013-2015, I promoted the series Internationally and have so far gotten it published in in Italy, Germany, Czech Republic and the US. Yaaay!! This story actually came to me back in 2010 when I first was asked by the manga publisher TOKYOPOP in Germany to pitch a new project for them. 2011 was a year full of work with the Swedish children book series Häxfolket (see below) so I didn’t have time to make them a full pitch until 2012. Kabusa Böcker who published my Swedish manga Mjau! 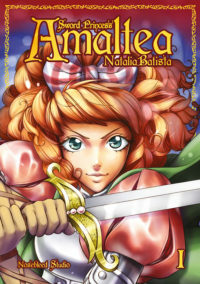 book 1-4 back in 2010made an omnibus (collected volume) with the 8 first chapters of the manga. Released in October 2012. In 2017 Nosebleed Studio took over the publication. I made this 32-page manga for a competition in the Japanese manga magazine Ribbon, andreceived an honorable mention and a review the end of issue #6 2012. It is also published in Nosebleed Studio Anthology – Seaside Stories which is avaliable for purchase in the shop. Karin works as a clown at the circus with her family and friends, and her pet monkey Monki-chan. But unlike the trapeze boy Jon and aerial artist Bella, Karin feels uncool and insecure.Is she just a funny clown, or can she do something more impressive like they do? I made this 32-page manga for a competition in the Japanese manga magazine Ribbon, andreceived an honorable mention and a review the end of issue #2 2012. It is also published in Nosebleed Studio’s 5 Years Jubilee Anthology which is avaliable for purchase in the shop. Andi, Marcus and Elise are best friends since high school. But it hasn’t been an easy friendship. Depression, secret love, homosexuality and sorrow will line their mutual story. This is the German version of my prior self-published manga, that Tokyopop in Germany decided to publish in October 2010. A 200 page one shot book, and my first project with the Tokyopop team, and hopefully not the last! Ville is a lonely stray kitten, left to his destiny out in the rain. Suddently a young woman picks him up and brings him home with her. There Ville gets to know another little kitten called Vanilj. Together they play, go on ghost hunt, climb too high, have picnic and get new friends, the little mouse Mini and the angry Magpie. This manga was published as 4 small books in Swedish by Kabusa Böcker in 2010, and also as a regular comic in Portuguese manga magazine Banzai since Spring 2012. 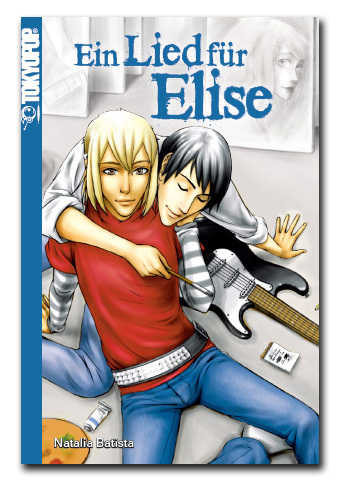 A Song For Elise started out as a fanzine (selfpublished comic magazine) project, and later became an online manga, and finally I selfpublished this 200-page long book in Spring 2009. Yay! It is avaliable for purchase in English at the homepage or via the shop here. Anti-Spam Quiz: What is comics called in Japan? Subscribe to our newsletter to keep yourself updated on our projects and books!